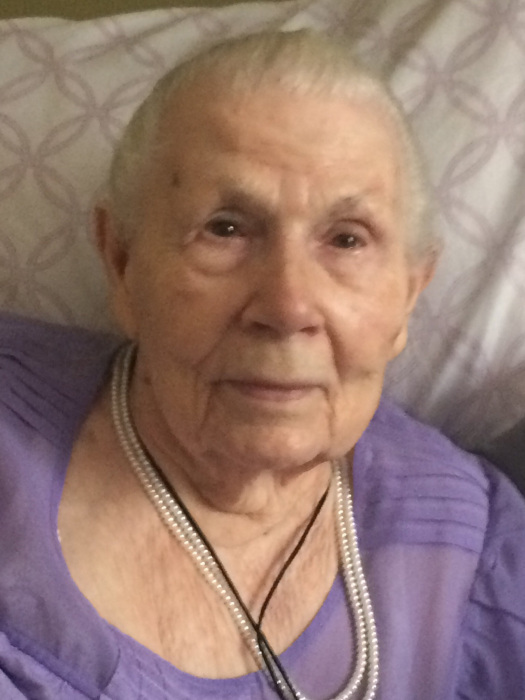 Verus Nebeker Thornley, age 94, passed away Saturday, February 9, 2019 at Chancellor Gardens surrounded by her family. Verus was a long-time resident of Layton. She was born August 3, 1924. She married William Dickson Thornley on September 22, 1952. Verus loved to draw, crochet, read and spend time with her family. She worked and later retired from Hill Field where she was a Payroll Clerk. Verus is survived by her oldest son John Thornley, three granddaughters, Kimberly Aaron Zika, Breean Thornley, Thursday Thornley and seven great-grandchildren that will miss and love her very much. She was preceded in death by her parents, five brothers, two sisters, husband William Dickson Thornley, her children Mary K. Thornley, James Michael Thornley and her baby Sharon Kim Thornley. Funeral services will be held Saturday, February 16, 2019 at 11 a.m. at Lindquist’s Kaysville Mortuary, 400 North Main. Friends may visit family Saturday from 9:30 to 10:30 a.m. at the mortuary. Interment, Kaysville City Cemetery.